A Piece of Monologue brings to my weary attention another one of The Guardian newspaper's effortlessly obtuse top ten literary lists. This time it's "top 10 absurd classics". Of course, it includes Waiting for Godot. Cautiously, I explain that I believe an artist's work is inconceivable without a strict ethical sense. "What you say is true. But moral values are inaccessible. And they cannot be defined. In order to define them, you would have to pass judgement, which is impossible. That's why I could never agree with the notion of the theatre of the absurd. It involves a value judgment. You cannot even speak about truth. That's what's so distressful. Paradoxically, it is through form that the artist may find some kind of a way out. By giving form to formlesssness. It is only in that way, perhaps, that some underlying affirmation may be found. This is what makes Beckett a far more complex artist than the label "absurdist" allows. Perhaps this why it remains despite the author's explicit statements and the evidence of the plays backing them up. He seeks an underlying affirmation – why else would he continue? – while all around him hacks and inattentive culture-vultures chatter about "the absurd"; a value judgement to speed their fiercely middlebrow lives beyond anything distressing like the inaccessible. "The quality of today's literary writing arouses the strongest opinions. 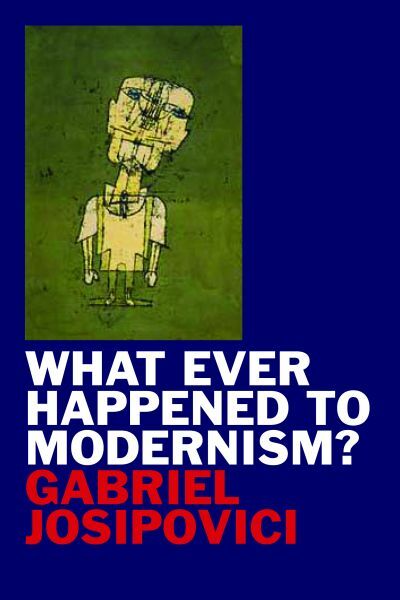 For novelist and critic Gabriel Josipovici, the contemporary novel in English is profoundly disappointing — a poor relation of its groundbreaking Modernist forebears. This agile and passionate book asks why. Modernism, Josipovici suggests, is only superficially a reaction to industrialization or a revolution in diction and form; essentially, it is art coming to consciousness of its own limits and responsibilities. And its origins are to be sought not in 1850 or 1800, but in the early 1500s, with the crisis of society and perception that also led to the rise of Protestantism. With sophistication and persuasiveness, Josipovici charts some of Modernism's key stages, from Dürer, Rabelais, and Cervantes to the present, bringing together a rich array of artists, musicians, and writers both familiar and unexpected—including Beckett, Borges, Friedrich, Cézanne, Stevens, Robbe-Grillet, Beethoven, and Wordsworth. He concludes with a stinging attack on the current literary scene in Britain and America, which raises questions not only about national taste, but contemporary culture itself." What Ever Happened to Modernism? is scheduled for a September publication. Read more on Yale UP's dedicated webpage. (Link via). Update: My review is now online. "Dante's Commedia ... and the medieval cathedrals were ... modelled on a book, the Bible, as that had been meditated to the West by the Church. And as the thinkers of the German tradition, such as Hegel and Nietzsche, understood, the fortunes of art in our time go hand in hand with the fortunes of theology." When in 1988 I first read this passage from The Book of God, I was struck enough to note it down despite lacking any comprehension of its relevance to my experience. My upbringing had been Christian inasmuch as prayers were mumbled at school assemblies and fortifying stories read from a large book we knew had to be special because it had gold-edged pages, but also secular to the point where that term, lacking a meaningful alternative, became as pale and hollow as faith. God meant nothing to us, yet neither did art. Both were rumours, legends, items of reverence at which we nodded in passing as we might the coffin of a distant relative. Detachment from one probably followed from detachment from the other, but how could I appreciate this? Since then reading and writing have become important to me in an excessive way; that is, more than it should do in order to get on in life, more than a source of organised information, more than escapism, more than craft mastery or self-expression. And yet not as a replacement for a lost tradition; there was, after all, nothing to replace. Is this excess subject to the fate of theology? How can I begin to seek an answer without immersion in the breach between tradition and its erasure? I am a child of that erasure; there is no way back. Perhaps the excess is more banally explicable. It may be said that I am, like everyone else, psychologically predisposed to such a need, and that it might well have been met by any number of alternatives: politics, science, music, sport, drugs, living life to the full. Religion is just an old-fashioned lifestyle choice. However tempting this answer is, and it is the one most easily within reach, it is for this reason not enough. It too has to be subject to the same question of fate. This is probably why I am hesitant to admire the publishing phenomenon led by Richard Dawkins, Sam Harris and Christopher Hitchens in which religious faith is resisted and atheism or scientific scepticism encouraged. Not because I tend toward faith but precisely because I do not. Dawkins rejects theology a priori, not even beginning to offer an immanent critique, a position that left Terry Eagleton rightly incredulous. Dawkins' science thereby looks like fundamentalist theology by other means. I recognise its symptoms in the pursuit of the excess of writing. The enthusiastic reception of David Shields' Reality Hunger – a.k.a. The Novel Delusion or, Fiction is Not Great – is a small trace of the general desire for answers, judgement, for the Kingdom of God to be manifest on Earth as it is in Heaven. It is understandable, yet wrongheaded. In The Book of God, Josipovici argues for a reading that lives in the uncertain light of the Bible's stories; that is, does not seek answers to questions not posed by the supreme fiction. To solicit answers is to miss the experience of the narrative as a whole. The whole, however, can also appear as an absence. The importance of writing in my experience is not that it happens upon answers that justifies its existence and, in doing so, puts an end to writing, but that it brings to life the distance between tradition and its erasure, and makes writing all the more necessary. The distance is a space opened by all writing; a space in which absence becomes the model on which the modern equivalents of the Commedia, if not cathedrals, may be built. Kafka's aphorism is a good example, and typical of this writer, in that it both condemns the rush to embrace an illusion – reality in books – while also implying that books themselves are an apparent fencing in of the apparent thing. He turns the accusation inwards even as it moves outwards. This dual movement is the paradox at the heart of Modernist writing. It's a paradox that can be seen as a problem, a fault demanding an evangelising manifesto to vindicate writing in a positivist, scientific culture. It is Isaac Luria (a saintly man and profound thinker of the sixteenth century, whose influence we know was great) who, interpretating an idea from the ancient Cabala ... recognised in the creation an act of abandonment on the part of God. A forceful idea. In creating the world God does not set forth something more, but, first of all, something less. Infinite Being is necessarily everything. In order that there be the world, he would have to cease being the whole and make a place for it through a movement of withdrawal, of retreat, and in "abandoning a kind of region within himself, a sort of mystical space." In other words, the essential problem of creation is the problem of nothingness. Not how something can be created out of nothing, but how nothing can be created in order that, on the basis of nothing, something can take place. There must be nothing: that the nothing exists is the true secret and the initial mystery, a mystery that begins painfully with God himself – through a sacrifice, a retraction, and a limitation, a mysterious consent to exile himself from the all that he is and to efface and absent himself, if not disappear. (It is as through the creation of the world, or its existence, would have evacuated God from himself, posed God as a lack of God and therefore had as its corollary a sort of ontological atheism that could only be abolished along with the world itself. Where there is a world, there is, painfully, the lack of God.) A profound thought indeed.